ERGONOMICS: The seat of the Diavel Diesel offers generous space and is just 770 mm from the ground, which, together with the handlebar set back, guarantees a pleasant and comfortable ride. Full control and maximum comfort, with the inimitable cruiser style. 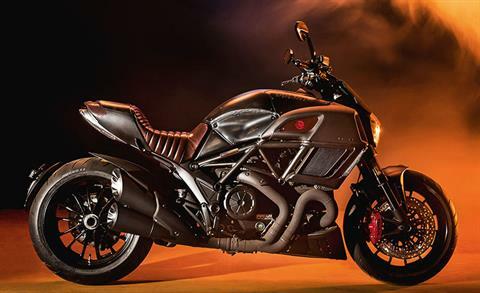 SUSPENSIONS AND BRAKES: On the front the Diavel Diesel has a 50 mm fork with anti-friction legs in DLC diamond carbon. The fork is fully adjustable in the spring preload, compression and rebound. The rear monoshock acts on the single-sided swinging arm with progressive linkage and is fully adjustable for compression and rebound. The braking performance of the Diavel Diesel is guaranteed by Brembo brakes with monoblock callipers driven by radial pumps. On the front, two semi-floating 320 mm discs are paired with twin four-piston radial callipers, while on the rear the 265 mm disc is engaged by a Brembo two-piston calliper. 240 MM REAR TYRE: The engineered chassis together with the 240 mm rear tyre specially developed by Pirelli for the Diavel adds personality to the bike and at the same time allows for high levels of handling but also comfort for everyday use. 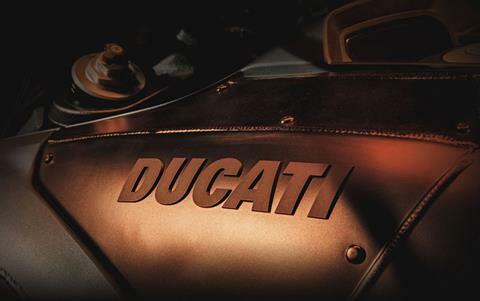 TESTRATRETTA 11°: The heart of the Diavel Diesel is the Ducati Testastretta 11° Dual Spark, a direct development of the Ducati Corse engines that have won championships on racetracks across the globe. The Testastretta 11° DS delivers the power and torque of a Superbike, 162 HP and 130 Nm, taming and modulating them with the Ride-by-Wire management system that combines high performance with a ride that is smooth and perfectly manageable. RIDING MODE: The Riding Modes offer a riding experience that is exciting yet safe and intuitive. The three preset modes are selectable even while riding, immediately affecting the "character" of the Diavel Diesel, adjusting the maximum power, the engine output and the Ducati Traction Control. 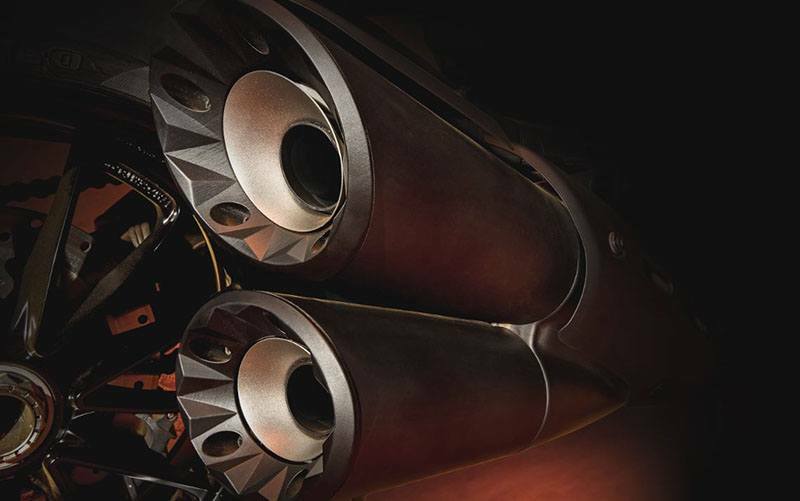 EXCLUSIVE EQUIPMENT: The Diavel Diesel is made unique by details in hand-brushed steel with visible welds and rivets, like the tank cover, the headlight fairing and the passenger seat cover. The visible welds also appear on the anodised black side conveyors with a red methacrylate centre cover bearing an embedded Diesel logo. The red colour is also found on the LCD instrument panel, the front brake callipers and five chain links. The pipes of the exhaust system feature a Zircotec black ceramic coating. The silencers with billet endcaps are also black. 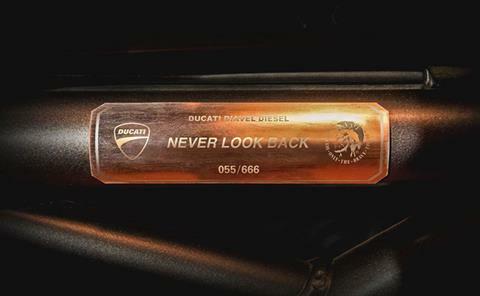 The Diavel Diesel features a leather seat with a unique design and a numbered plate on the frame. The pyramid logo appears on the seat, on the front mudguard and on the silencer endcaps. The standard equipment of the Diavel Diesel series also includes rear-view mirrors with billet sump and leg, specially designed bike cover and rear stand. DUCATI SAFETY PACK: The standard Diavel Diesel is equipped with the Ducati Safety Pack (DSP). 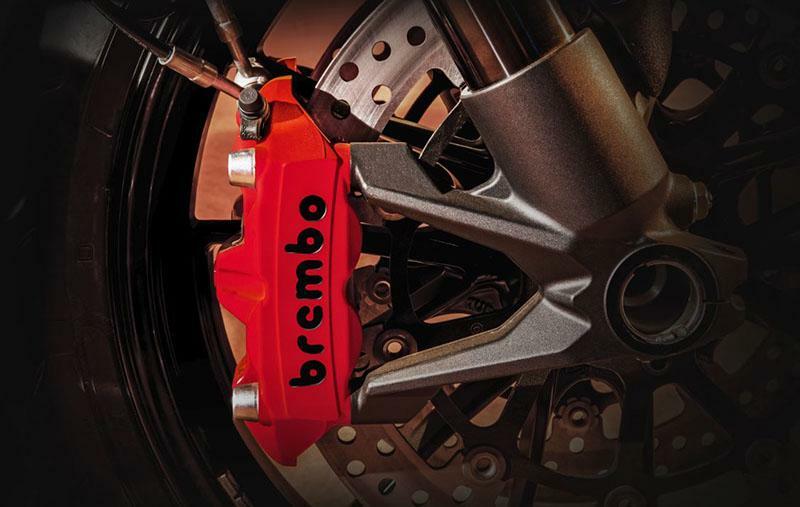 Designed to guarantee maximum vehicle control and active safety when riding, the DSP includes the Brembo brake system with Bosch ABS and the Ducati Traction Control (DTC) with eight levels. EXCLUSIVE EQUIPMENT: The Diavel Diesel features a leather seat with a unique design and a numbered plate on the frame. The pyramid logo appears on the seat, on the front mudguard and on the silencer endcaps. The standard equipment of the Diavel Diesel series also includes rear-view mirrors with billet sump and leg, specially designed bike cover and rear stand. TANK COVER: The Ducati Diavel Diesel features hand-brushed steel superstructures with visible welds and rivets, making it absolutely unique and timeless. 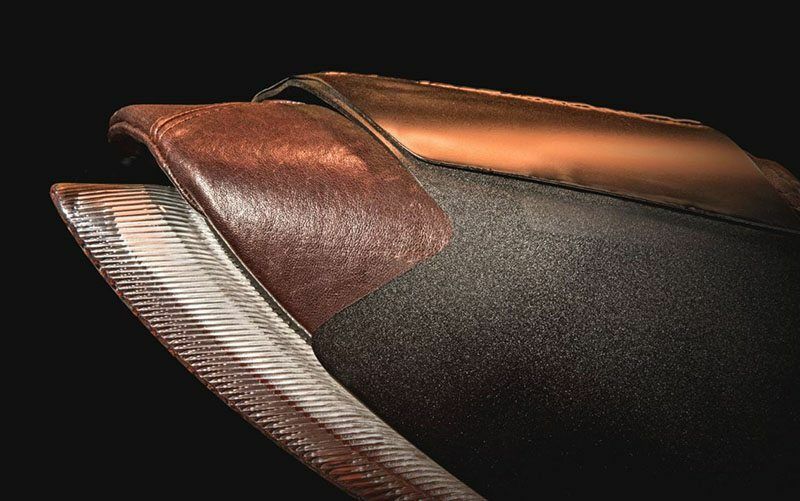 Details such as the tank cover, the headlight fairing and the passenger seat cover are examples of craftsmanship and style. 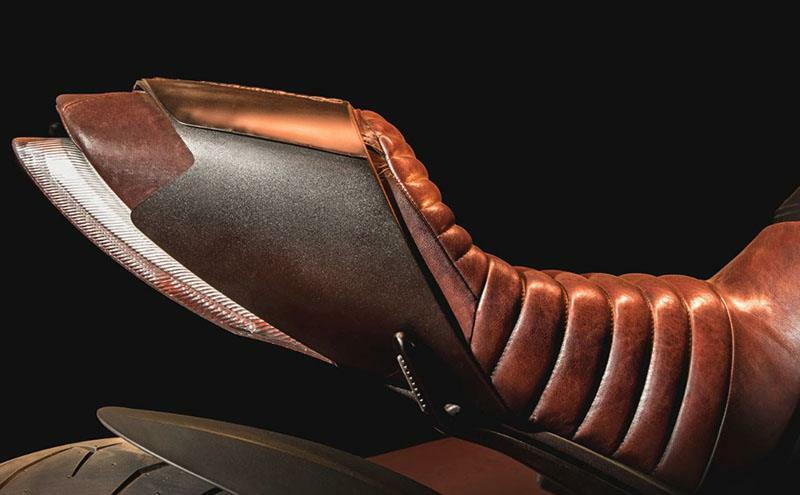 SEAT: The genuine leather seat is an exclusive and unique element of this Diavel and bears the symbol of a pyramid with three equal sides identifying the three Ds of Ducati, Diavel and Diesel. 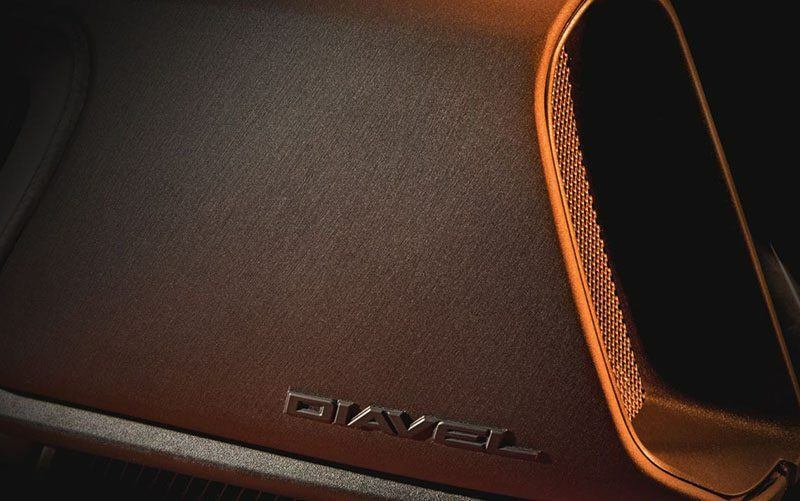 UNMISTAKABLE DETAILS: Other distinguishing features of this very special Diavel are the covers of the side conveyors made in red methacrylate with the embedded Diesel logo. Red is also the colour of the Brembo front brake callipers, of five chain links and the LCD instrument panel that recalls vintage digital displays. 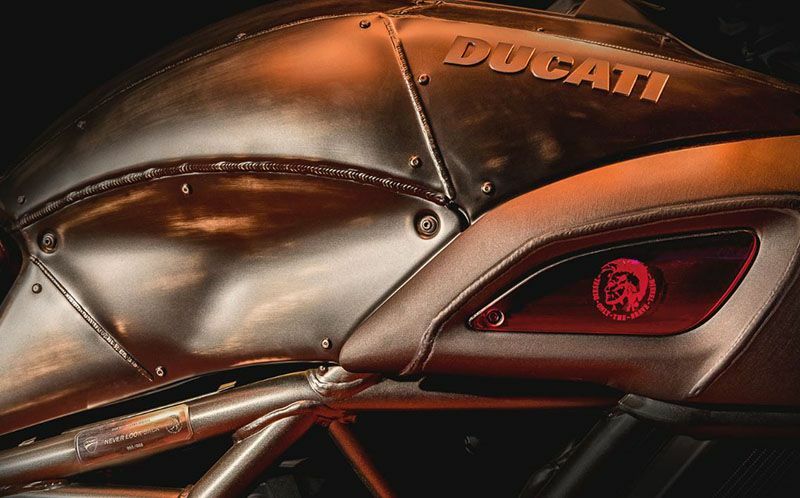 EXHAUST SYSTEM: The exhaust of the Ducati Diavel Diesel is another small work of art thanks to the black Zircotec ceramic coating on the tubes and black silencers with billet endcaps also bearing the pyramid logo. 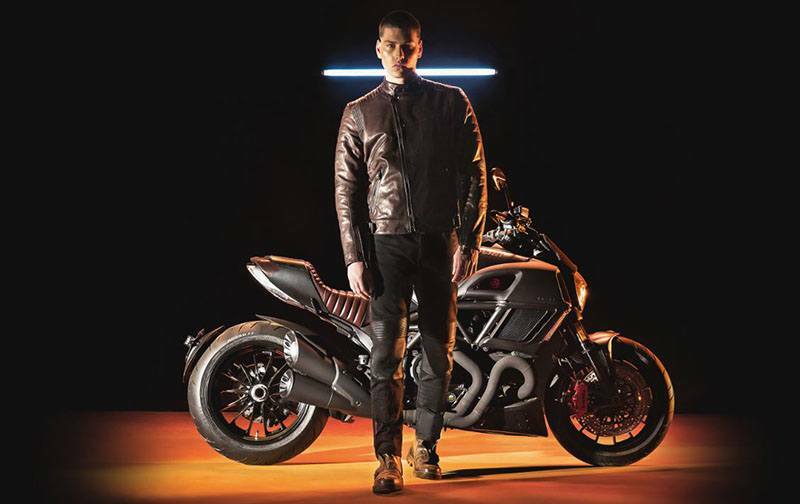 CAPSULE COLLECTION: Diesel has created a capsule collection dedicated to Ducati that reflects the DNA and common roots of the two brands: creativity and innovation are the key elements that make Ducati and Diesel two icons among products Made in Italy. The collection consists of two Jogg Jeans, a leather biker jacket and two T-shirts. Front - Light alloy, 14-spoke, 3.50 in. x 17 in. Rear - Light alloy, 14-spoke, 8.00 in. x 17 in.